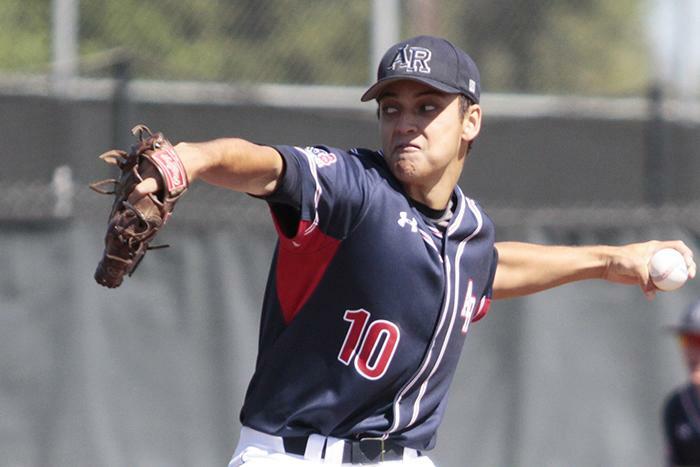 A 2-for-4 day from first baseman Dalton Devries helped lead American River College to a 4-2 win Tuesday at Sierra, as starting pitcher Matt Gunter (6-4, 3.55 ERA) struck out six in 8 ⅓ innings in his return to Sierra College. Gunter had tried out for Sierra’s team in the fall and did not make the squad, and said the win went beyond more than just a good performance. ARC scored twice in the first inning on an RBI single by right fielder Alex Gaskin and a fielder’s choice off the bat of Devries and scored in the third and seventh innings on singles by Devries. Gunter breezed through the first eight innings, only facing a threat in the fifth. Gunter walked the first two batters, but Sierra’s chance at a momentum swing was quickly shot down after a sacrifice bunt attempt by left fielder Austin Blatnick. ARC third baseman Austin Call charged the ball and made a rocket throw to first base to just beat Blatnick for the out. Blatnick collided with first baseman Dalton Devries incidentally, causing both players to fall to the ground. Sierra second baseman Kyle Lewis, who had led off the inning with a walk, advanced to third on the bunt play and headed home following the collision. Still on the ground, Devries tossed the ball up to ARC second baseman Cameron Bennett, who had shifted over to back up the play at first base and darted a throw to the plate to nail Lewis for the twin killing. ARC head coach Doug Jumelet agreed. “Pretty nice play,” he said. With two on and one out in the ninth, ARC pitching coach Preston Vancil made a visit to the mound to consult Gunter, but let him stay in the game. Gunter was removed after he gave up an RBI double to replacement shortstop Froy Smith that left runners at second and third and brought the tying run to the plate. “(He told me) it was a good outing , but your pitch count’s getting up there,” Gunter said of his conversation with Vancil when he was pulled. Vancil was appreciative of Gunter’s effort even though he didn’t finish the game. “I’m really proud of him. Those are the type of outings he should put out,” Vancil said. Gunter was understandably disappointed to not finish the game, but said he understood why. “It was a still a close game the whole time, but they could’ve come back pretty easy,” he said. Relief pitcher Mike Marlar took Gunter’s place and Sierra scored on a groundout but never put the tying run on base. For Marlar, it was his state-leading eighth save of the season. Vancil expressed full confidence in Marlar despite entering the game in a tough spot and Gunter agreed. “Definitely, especially Mike,” said Gunter of Marlar’s ability. “He always shuts it down. Be the first to comment on "ARC defeats Sierra in series opener as Gunter rolls"